One way to limit weeds in the border is to cover every square inch with plants, strangling any intruders before they can get a hold. Lavinia and Lionel are masters of this method. So what do I say when the lovely Lav presents me with a new purchase and says “Now where shall we put this beauty?”. That’s my favorite weed-control method too (lush dense groundcover). Aside from the aesthetics, I’d much rather have something that increases over time than mulch which breaks down and has to be continually repleni$hed! It is the less stress method, until an intruder pokes his head up in the middle of the lot, very difficult to get to with crushing all your lovelies! It is a battle, if anyone knew the torment they would never start gardening. Just a minute, I remembered all the good bits …… it is well worth it! I agree covering the ground is the best weed control and a tapestry of plants looks wonderful. It doesn’t work for ground elder though. 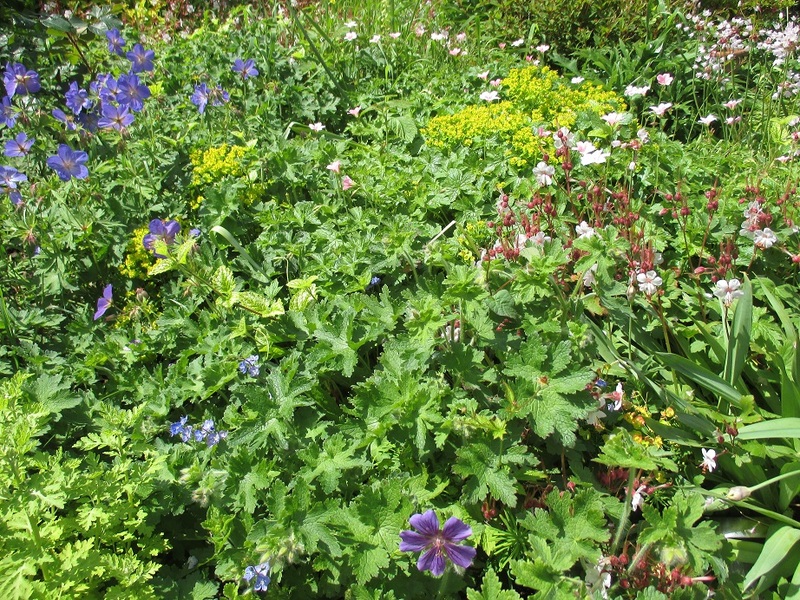 You can always dig up a bit of Geranium to make room for more plants. Or the lawn. Who needs lawn? Oh yes, the ever decreasing lawn syndrome, I have been a fan for a long time! A friend has had great success getting rid of ground elder by growing a very pretty low growing Symphytum, something similar to ”Hidcote Blue’, that got rid of the ground elder but now the Symphytum wants its own way! That is the problem, they just don’t know when to stop! Ha ha. I’m with Lavinia and Lionel on this one. Every patch of weeds pulled means a space for another plant! There is always room for one more!